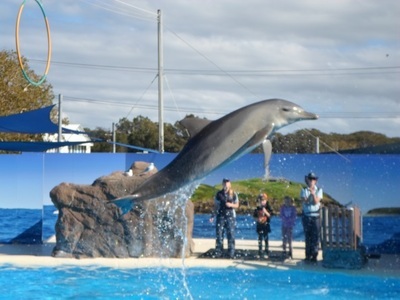 Dolphin Marine Magic offers visitors an amazingly interactive experience that far exceeded my expectations. The attraction isn't like a zoo, where you spend your time visiting different enclosures and marveling at each animal, perhaps catching a few shows and talks along the way. Instead, these usually 'additional' experiences are the whole point of your visit. Everything takes place in two sessions - morning and afternoon - and the schedule is designed so that there's always something about to start, whether it's a feeding, a show or the unique 'kisses'. Both sessions are exactly the same too, so you don't really need to spend more than half a day here. 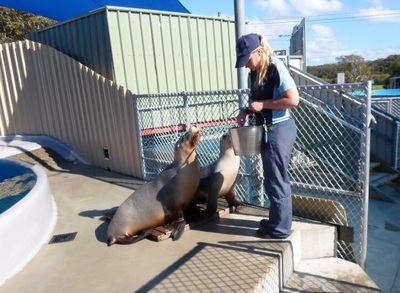 The first experiences on offer are the seal and dolphin kisses, which are free with admission and run in the half hour before the main show. Luckily you don't have to choose between them; I managed to get a kiss from both animals and still be in my seat early enough to participate in a spontaneous seal-feeding while everyone waited for the show to start. When you're getting your kisses, a professional photographer is on hand to record the moment. I ended up purchasing a copy of both photos because everything happened so fast once I got to the front of the queue that I felt like I needed a lasting reminder of my experience. You can also take your own photos but you're not allowed to stand with the photographer, so they won't turn out as good (the seal photos are the better option if you want to take your own photos). 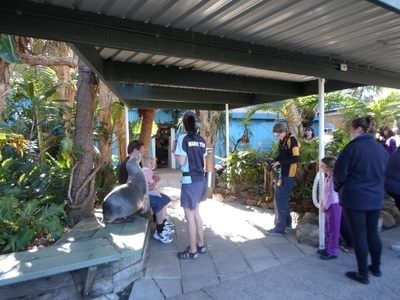 The main show is called the Marine Discovery Presentation and features both seals and dolphins. On the day I visited, a different dolphin to the usual one was performing, but we still got to see all sorts of tricks, like leaps out of the water, as well as a special skill this particular dolphin had taught herself - balancing a ball on her nose like a seal. The seal parts of the show happen between the dolphin pool and the grandstand and I found it difficult to see over people's heads a lot of the time. There seemed to be demonstrations of rolling, speaking and ball skills, with kids able to get involved by tossing balls and rings to the seals (which was possible with the dolphins too). 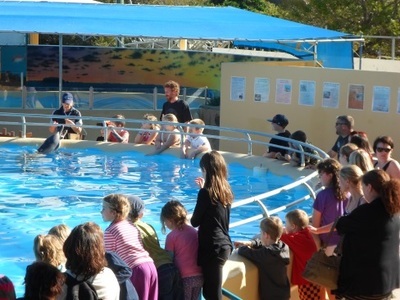 If you're not chosen to be part of the show, you still get the chance to pat a dolphin afterwards, as you wait at the edge of the pool while it swims around. 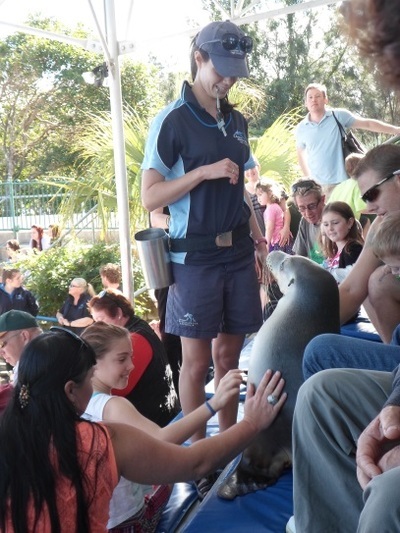 It doesn't usually happen, but on the day I visited we all got to pat the seal after the presentation too, when it was brought through the stands to each person. 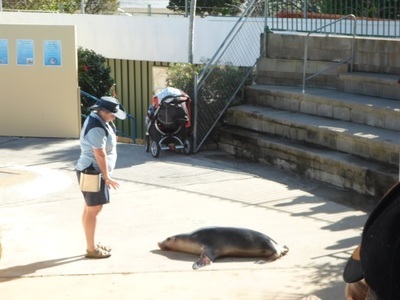 I also managed to pat seals at other stages throughout the day though, when they were following trainers around the grounds, so you'll probably get a chance to do so at some point anyway. After the show the feeding sessions start and the first one is the fish feeding. After a brief keeper talk (when fish stick their heads out of the water, impatient for their feed) trays of food and tongs are placed around the pool and everyone gets at turn holding the food out for something to take. Most people seem to drop theirs in surprise when it actually happens. Right next door is the turtle feeding, but this one isn't interactive. 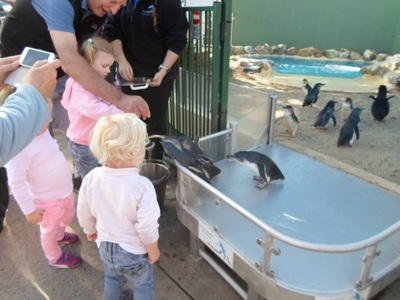 Then there's the feeding of the Little Blue Penguins. During some periods throughout the year (i.e. 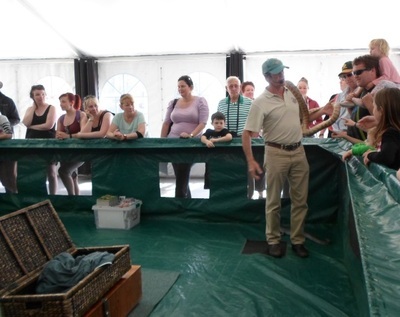 school holidays) Steve McEwan's Reptile World visits Dolphin Marine Magic with a show that is both educational and interactive. Hosted by McEwan himself, it teaches you about snakes, lizards and other reptiles, with a focus on safety and first aid tips. While he talks, McEwan brings the creatures around for everyone to pat. 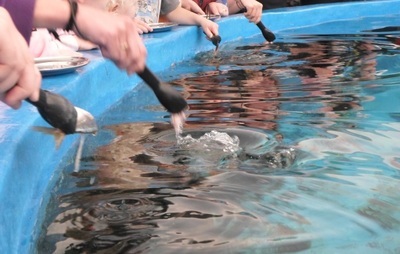 Other than all the interactive experiences, there isn't that much else to see at Dolphin Marine Magic, as every species at the park is incorporated into one of the activities. There are some zoo-like permanent enclosures, but these can easily be caught in the few moments you have between the other activities, like the fish around Reef Tank, the Dolphin Pool next to the penguins, and the seals behind the Show Pool. 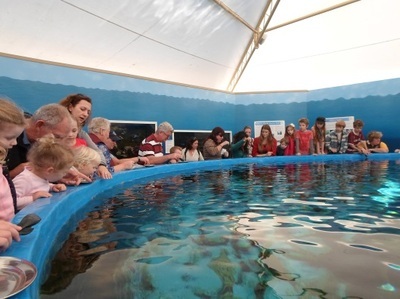 If you're looking for more however, there are some extra special experiences you can book, like seal and dolphin swims and 'meet the animal' experiences. But so much is incorporated into the average visit that you should leave pretty satisfied anyway.